- First, please forgive the look of this list! I am not an expert at website designing but I tried and tried to make this look presentable and it actually DID when I first layed it out in another program but when I put it up on my site it looks pretty jumbled. I've spent a long time working on getting this list f25inished and am not about to try and do it over so please try and put up with this, ok. I think most of you will be able to sort through all the mistakes but if anyone knows anything about HTML web page design and can help me make it look a lot better I beg of you to contact me. Thanks. I'm sure you'll have loads of questions so just write them down and ask when you get time and time is what you'll need to go over this completely absurd LP list Have a good time! NOTE: LISTINGS IN BLUE ARE NEW ONES! VARIOUS ARTIST LP'S. ALL MINT - / MINT -/ NO ELVIS PIC ON FRONT OR BACK UNLESS NOTED! 107.4028 SAUDADE JOVEM. ORANGE RCA VICTOR. 1975. LOVE LETTERS. $4 IYES I KNOW IT MAKES NO SENSE AS VOL. 1 HAS AN EARLIER CATALOG NUMBER!!! 104.4081 ROCK N ROLL '60.ORANGE RCA VICTOR. 1976. ARE YOU LONESOME. INTS 1012 ELVIS SINGS FLAMING STAR. GREEN RCA INT"L LBL. VG 6 / GOOD. $4. (NOTE: ALL OF THE LP'S BELOW CONTAIN SONGS BY VARIOUS RCA ARTISTS INCLUDING ELVIS. NONE OF THEM HAVE PICTURES OF ELVIS ON THE FRONT OR BACK UNLESS NOTED! NW 207 COUNTRY MUSIC IN THE MODERN ERA (1940S-1970S). 1975 2 LP BOOKLET COVER SET ISSUED BY NEW WORLD RECORDS. THERE ARE PAGES WITH LINER NOTES INSIDE. "MYSTERY TRAIN". 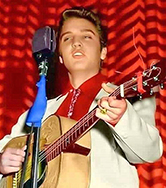 THIS MAY HAVE BEEN ONE OF THE FIRST LP'S OUTSIDE OF RCA TO USE AN ELVIS SONG! STILL SEALED (AT LEAST ON THREE SIDES. THE TOP IS OPEN! $15.